I travel a lot. Both for fun and for my day job. And I’m constantly changing up what I use as my carry-on bag for flights. I’ve gone from an old Puma duffle bag to a nondescript leather messenger bag, to a small carry-on suitcase. Each solution has either had too much open space (duffle bag), or wasn’t conducive to my tech gear (suitcase), or flat out didn’t offer enough storage space (messenger bag). So when Solo asked me if I would want to check out the Solo Rival Backpack my interest piqued. I haven’t owned a backpack for over a decade, so I was completely ready for the experiment. Over the last month which included a trip to Chicago (I’m in California) I’ve been using the Solo Rival Backpack almost daily and am now ready to tell you what I think of it. The Solo Rival has an incredibly straightforward design. 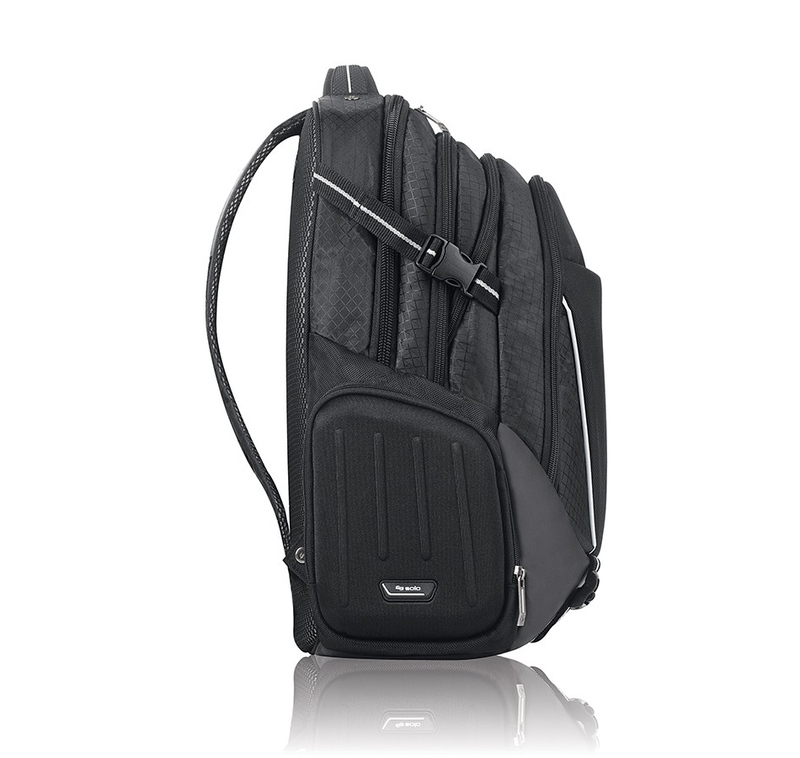 This is not a flashy bag by any stretch, its black with accents of silver, gray, and white. It’s a design that says, this is more of a utility then it is going to turn heads. The bag contains four primary compartments. The biggest is a 17.3” padded compartment made for laptops. I personally use a 13” Macbook Air so it had plenty of room. I also put my wife’s 15” Macbook Pro in there and it fit nicely. I was less impressed though with the minimal padding in this compartment. The features say its fully padded but really only the part facing your back has any real padding. With any sort of travel, you know stuff is going to get thrown around, and I would have preferred more cushion. From there you have three really large compartments. For my trip to Chicago I actually used the second compartment for my running shoes and gym clothes, and the third pocket for my iPad Mini and my Nintendo Switch. All of my cords, external hard drive, and headphones went in the smallest fourth compartment. One of my favorite design features are located on the side of the backpack. There are located hard shell compartments that I ended up putting a digital camera. Although this backpack is bulky it can also be trimmed down quite a bit by the straps on the side of the bag. When I was using it for my normal day-job I didn’t need all of the compartments so I would tighten it up and the bag collapsed down to a nice manageable size. As mentioned earlier in the review, I’ve been testing the Solo Rival Backpack for around a month. In that time I’ve used it in an office setting as well as on a weeklong trip to Chicago. For the first couple of weeks, I didn’t get much extra use out of the Solo Rival Backpack. It held my laptop nicely and some days I’d use the headphone cord pass through from the front pocket to listen to music while I walked to my destination. Where the bag really shined was when traveling. The bag is perfect for either a short getaway or a long vacation. Walking the streets of Chicago in 80-degree heat with a full bag was incredibly comfortable. There’s some solid support on the arm straps and on the back that makes walking around with it a breeze. Probably the biggest compliment though I can give the Solo Rival is that its versatile. Outside of the first compartment which is specifically made for a laptop, the rest of the bag can be used for quite a bit. I could easily see using this as a weekender bag with my laptop and a couple changes of clothes and even an extra pair of shoes. Even after my full month of testing the bag still looked in great shape, to most it probably will look brand new. My big concern with a backpack like this is that it would be bulky and unwieldy to travel with. Luckily the Solo Rival backpack is incredibly versatile and insanely comfortable. My one negative on the bag is the laptop compartment which I think could have used a lot more padding for protection. As long though as you’re not hiking with the Solo Rival it should do plenty to keep everything as safe as possible. For me though, the Solo Rival has so many nice small touches that I don’t see me using any other bag for travel anytime soon. I adored the Everyday Messenger Bag, but I think I love the Everyday Backpack just a little bit more. The backpack is jam-packed with features, all of which are well thought out, without taking away from the bag's stunning design. I’m always on the hunt for my next pair of headphones. Just as visuals in games improve, so too does sound design. I was just recently scrolling through Spotify and I came across the soundtrack to the recently release Horizon: Zero Dawn. An hour later I just realized that I could just have easily spent the time listening to a full movie score.